I have been posting daily since the calendar flipped to July because there is just so much going on that if I don’t write them up – posts will get buried! Not to mention, I’m on my steroid regimen again and I am running with the overflow of energy. I’ll probably crash and burn in 24 hours, but I’m okay with that. After feeling like complete crap for several months, it’s hard to take for granted the improvements I now feel. I can finally get out to see the mountains I love, find energy to cook wonderful food (and even taste and digest them! 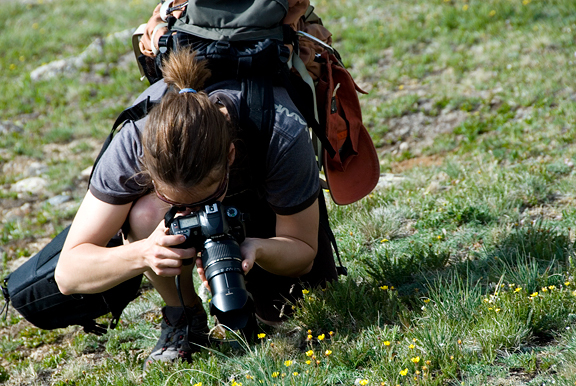 ), and have the patience to capture the beauty of our summer season with my camera. These are happy times. I’m also wired and exhausted, but I relish it – I really do. 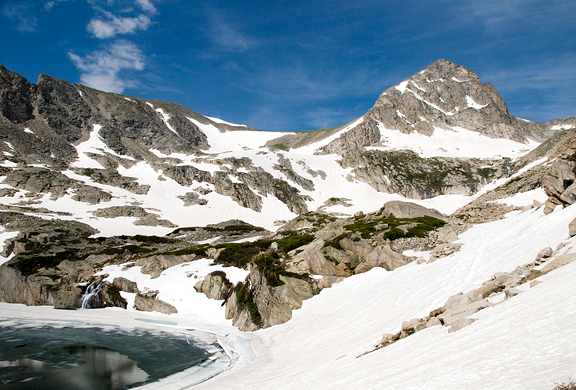 This morning we took another hike up to a lovely lake nestled in an alpine basin at roughly 11,300 feet. Invigorating! 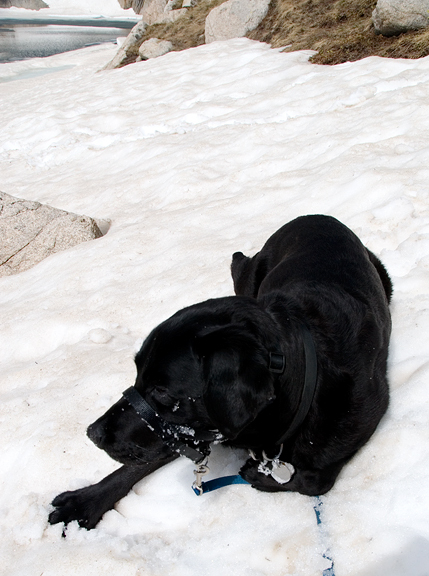 There was still plenty of snow, which is a good thing because it has been so hot here lately. Several more varieties of wildflowers were beginning to bloom, but the lake is still under a lot of ice and snow. I’m crazy for the mountains. Even though I love barbecue, I am no barbecue expert. I’m a faker to some degree because we use a gas grill and oven instead of charcoal grill (fear of burning down state of Colorado). Most of what I’ve cobbled together in the past few years has been from reading/researching all sorts of recipes from various regions and sources. I lived in central New York for more years than I care to recall, but I still never got around to dining at Dinosaur Bar-B-Que in Syracuse – a place many of my friends swear by (one even had them cater her wedding!) I did manage to pick up a copy of the book before we moved back West. The one thing I cannot stand about barbecue chicken is when someone takes a boneless, skinless chicken breast and wipes barbecue sauce on the thing while it turns to rubber on the grill. That is disgusting. People who cook chicken like that should be smacked about the head with that piece of rubber. I know people who do this. I have to squint my eyes and keep my hands by my side when I witness this atrocity being perpetrated on chicken in this manner. The best barbecue chicken has the bone and skin still on it. You don’t have to eat the skin, but you need to cook with it on the meat. The recipe I quite enjoy for barbecue chicken comes straight from my Dinosaur Bar-B-Que cookbook. Good stuff. I am partial to chicken leg quarters. It’s a nice honking piece of chicken and it doubles as a weapon to boot. Little pieces get dried out too quickly. I find the leg quarters remain juicy and full of flavor during grilling – far better than their breast counterparts. Dark meat is where it’s at. When applying the oil and rub mixture to the chicken, I like to get a little of that under the skin for some extra seasoning and flavor. Just be careful that you don’t tear through the skin. I let my chicken sit for at least 8 hours, covered in the refrigerator, after the rub is put on. 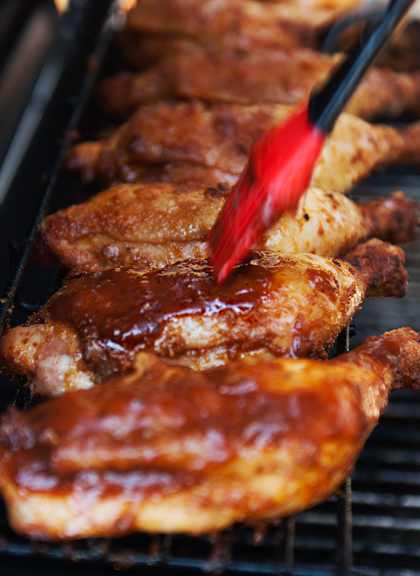 The chicken is grilled and then in the last ten minutes, a nice brushing of barbecue sauce ensures a decent glaze. I personally like to serve extra sauce on the side with the finished chicken. We had this for our fourth of July dinner. This is a great recipe to make that doesn’t require much preparation – just a little planning ahead of time and lots of napkins when you eat it! 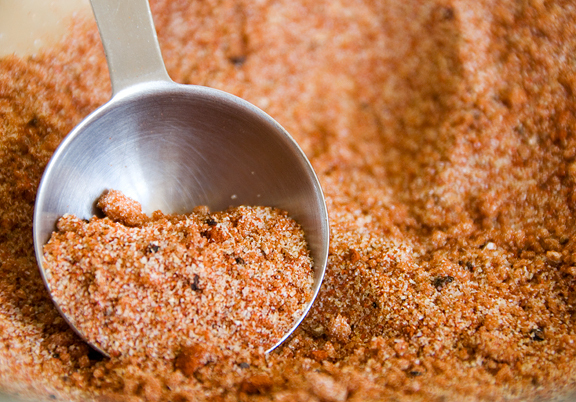 All-purpose red rub: Mix all ingredients into a bowl and rub them together with your hands. Store in plastic or glass container until ready for use. Makes 2 3/4 cups. Mutha sauce: Sauté onions and garlic in oil. Season with salt and pepper. Add remaining ingredients and bring to boil. Reduce to simmer for ten minutes and let the sauce cool. This makes a ridiculous amount of sauce – something like 10-12 cups. 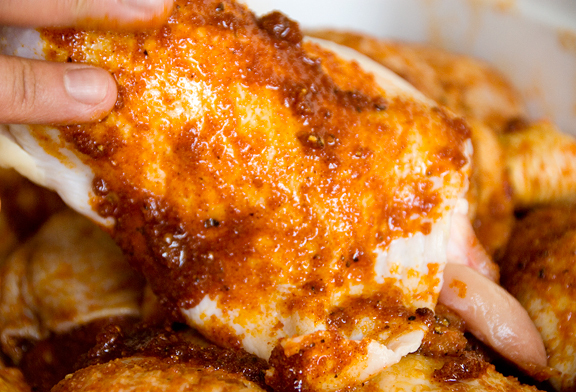 Chicken: Mix the oil and the rub together in a bowl and massage it into the chicken pieces. Cover and refrigerate the chicken until you are ready to grill it (I gave it 8 hours). Over a 325° to 350°F temperature grill (when lid is down), position the rack as high above the coals as possible. Arrange chicken, skin-side up, directly over the coals. Close and cook for 25 to 30 minutes then flip the chicken over and cook covered, for another 20 minutes or until internal temperature reaches 160°-165°F. Flip all pieces skin-side up and slather on the Mutha Sauce. Close the lid of the grill and cook for 10 more minutes to glaze the chicken. Serve with extra sauce. Feeds 4-6. I’m glad you have mega-energy, and your frequent posts make for good, wholesome & delicious procrastination from my thesis writing! Although due to some looming deadlines, I am at present ignoring the puku (the virtual one – my food blog. The physical one – my stomach – is being attended to still!) visiting Use Real Butter (updated daily!) gives me a brief reprise to the great outdoors and pottering in the kitchen… can’t wait to join in again! Aw, such great pictures! I really love the marmot ones… Really wonderful! And that rub, gorgeous! Wow you really are getting your energy back. Loving the snow pics. Hah! “Mutha” sauce, is that the official name? 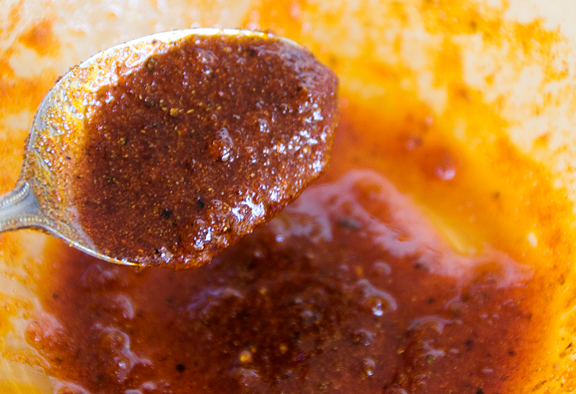 The recipe looks really good– it has all the essential elements for a true-blue American barbecue sauce. (Wait till I get my hands on a classic Filipino barbecue marinade– it will be very, very cheap :) My jaw dropped when I saw the recipe for the rub, though– a half-cup of paprika!! I think that’s more than what a big bottle (85g, Spiceco or Spice Island (?)) contains! Well, it looks totally worth it though :) My favorite part is the leg-thigh quarter, too. I’m not a fan of breasts and wings (two of the worst parts in my opinion, not for barbecuing), unless I was going for some “healthy” thing. I’m happy for your happy times. You know, pushing yourself every now and then makes the respite of the bed much, much sweeter! I went to Dinosaur BBQ twice while I lived in Syracuse. It was fun, but it didn’t knock my socks off. But some vegetarian friends of mine went when they were in town for our wedding, and they absolutely loved it. I do like their barbecue sauce though, it’s what I buy to put on pulled pork sandwiches. Jen glad to hear you feel the energy and good enough to enjoy such gorgeous scenery. i loved those phots. we are off next weekend to austria and i am looking forward to hiking and similar photos. Tremendous views: it looks like a great way to spend the day. Barbecued chicken as a reward: yeah, I’ll take those too. You have been posting like crazy! That’s good though because it means you are feeling good. Keep iti up. Marmots aren’t so cute when they chew on your car hoses and cables. After a couple days in the backcountry and returning to my car to find out that it doesn’t start because of those darn marmots….*%&*#!!!!!! 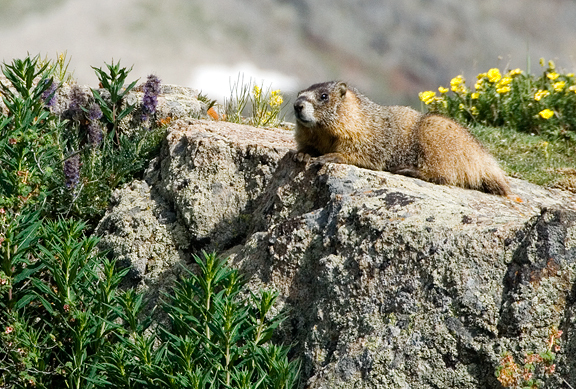 The only Marmot’s I like are the ones that make four season tents. These are just lovely pics and chicken Jen! I wouldn’t mind a serving, or two, of that bbq chicken! It looks fab and tons better than those overcooked chicken legs we get from the Indonesian counters in food courts here. Very pretty photos again! That sauce looks great! We saw marmots in Vail last week and joked about burning down CO as we improvised boiling water in the campfire (the bf was too manly for a camp stove but has since changed his mind). I’m guilty as charged as one of the perpetrators of chicken rubberisation. One day I hope to reform, the recipe you just posted might be the rehabilitation I need. It’s just that ever since I was a littl’un I couldn’t stand brown meat, my hubby is exactly the same. I want to like it (just as I wish I liked mussels) because then I could roast a chook and make stock. Anyway, maybe I’ll try this for my next barbie and see how I go. Thankyou again for your stunning photo’s. Be well. Mmm…all your food looks amazing! Not just the chicken, your past posts too! And I love your other, non-food photos as well! Jen, that lake looks so cool nestled in between those huge mountains!! I think you’d be proud to hear that I took my first food shots outdoors this past weekend and they turned out well! Thanks so much for your advice. Now I have to keep practicing… but a post a day, that’s just crazy! I hope you keep up your energy though, b/c your posts are great! Ack…I’m guilty of not keeping up with everyone else’s blogs too – and I always regret it when I come to yours and see all the fab stuff I’ve been missing out on! So glad you’re feeling better, and thanks for sharing the beauty outside (and inside! :) ) your home…makes me want to do a return trip to Colorado!! You know what I think is cute about marmots? The way they flippy-flip their tails around when they get riled up! Looks like you guys had a nice trek out there. Makes me miss the Rockies! 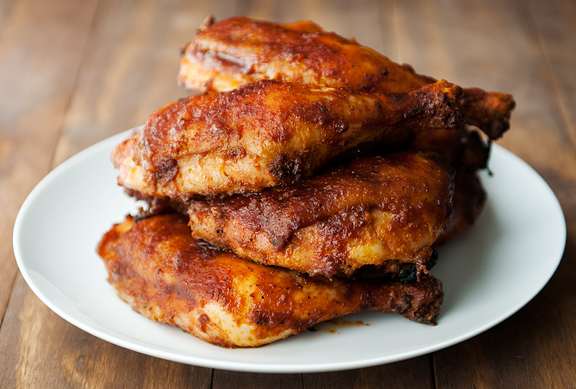 Great chicken, and thanks for a good thigh recipe–I love ’em! a week away and look how much i’ve missed. it’s great to see you having so much fun. i loved your post about photography. You hike and then you cook? You’re amazing. I hike and then I flop – can’t do anything after that! I generally don’t barbecue chicken because I turn it into rubber. :-D But I had the most succulent chicken – breasts that, too – this last weekend. So I am tempted to try it again. Your sauces sound quite exciting. Maybe if it cools down a bit – not likely this week though. That BBQ chicken looks really tasty! I hope you did not take it in a bad way! I am loving it! I am loving your energy….I just wish I had more time to cook all the delicious foods you post…like this crazy good looking chicken! Keep it up…at least it is a feast for my eyes! Wow. Fabulous chicken recipe. That Mutha Sauce looks amazing!! I can’t help but think that pork would benefit from meeting this recipe! It’s wonderful to hear you are feeling well. So, so great. Tks for sharing it with us, Jen. For a moment I thought the animals near the top of the post were the animals that I later realized were chicken. Phew! Rosa – thank you. 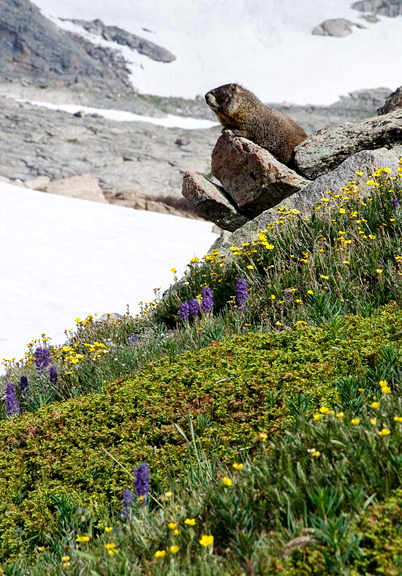 The marmots are such good posers, aren’t they? Barbara – it’s the steroids ;) But it feels great! Laura – yay chicken thighs! Bridget – yeah, never got around to Dinosaur, but I really enjoy some of their recipes. Their rubs and sauces are pretty good so far. JS – thanks. The mountains are forever my favorite place to be! WoRC – oooh, we had to worry about that out of Mineral King, CA. Those naughty marmots… They sure are cute though when they stay in their habitat :) You’re such a hoot. Mrs E – thanks dear! Melinda – It’s easy to reform, my dear. Come over to the juicy side of the Force :) Thanks. Manisha – ahhh, perhaps that is the benefit of living at 8500 feet? Walking up to bed is high altitude “training” hee hee. Where do you live, Manisha? How long does the mutha sauce keep? Mary – it will keep in a tightly sealed glass jar for several months without problems. Mmm looks so good! I just discovered your blog and I love it! What is Cayenne Pepper sauce? I’ve never heard of it before. I cannot begin to tell you how wonderful this recipe is. By the power vested in me by being born and reared in Tennessee, I hereby bestow on you the title of “Honorary Southerner.” Welcome, y’all.